Next, L'Antichambre has done a wonderful feature on Carbo's poker experience last weekend (in French, though the dialogue at the poker table is in English). I can't link/embed the videos directly but if you go to the L'Antichambre home page you can access the videos via the selection bar at the bottom of the page. Recently this blog mused about the arenas Guy played in. Today, NHL.com published an article about the closing of the Montreal Forum with some choice quotes from Carbo. 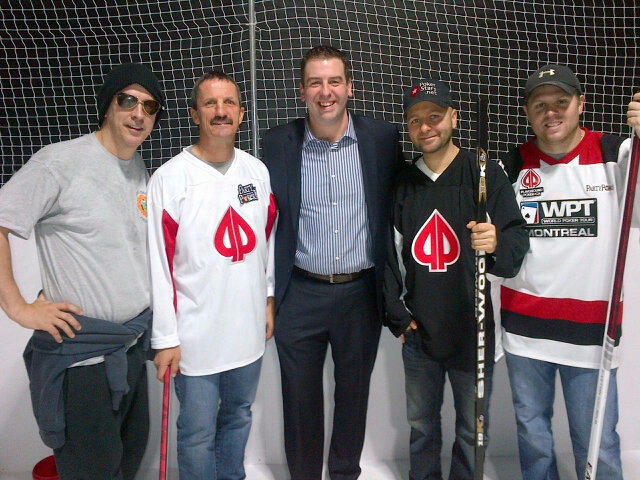 "I felt really lucky at that time," said Carbonneau, the captain of the '93 team. "I was in Dallas and it just happened that the last game at the Forum was against the Dallas Stars. We had a few guys who played in Montreal and it was definitely a date that was circled in the calendar. On top of that, the Montreal organization asked me if I wanted to switch jerseys after the game and come back on the ice and carry the torch. It was really a great day." In collecting news, I recently broke down and bought a case for my Carbonneau game-worn jersey. This purchase was spurred on because I wanted to have something to protect the jersey from my mother's cigarette smoke (she's working on quitting) and my curious orange kitten. I ended up going with a case from Frozen Pond here in Ontario, which meant that luckily I didn't have to pay customs. It's not a hinged cabinet -- the front pops off if I wish to remove the jersey. I also had room to place the photo of Guy wearing the jersey inside the frame. And it's UV protective as well. Overall, I'm very pleased. And yes, I own a Coach Carbonneau bleacher creature. Don't judge. From the search terms that people use to find this blog, and from the questions Carbo himself gets asked, it appears that there are certain things people want to know about Guy. It also occurs to me that some of the folks who wind up here are not as well-versed in Guy's career as I, and come to this blog looking for info. For that reason, I have compiled a basic list of questions which I call the Carbonneau FAQ. How old is Guy? Where was he born? What is his family background? Guy was born in Sept-Iles, Quebec on March 18, 1960 to Charles-Aime Carbonneau and Mary Ferguson, the second of five children. Is he married? Does he have any children? Guy has been married since 1981 to Line Boivin, a businesswoman. They have two grown daughters, Anne-Marie and Kristina. But isn’t one of his daughters married to Brenden Morrow? And they started dating when Morrow was Carbo’s teammate? Boy, that must have been awkward! Yes, Anne-Marie has been married to former Stars captain, Brenden Morrow, since July 20, 2002. They have three children together. And yes, they started dating during the 1999-2000 season (Morrow’s rookie season, and Guy’s last). To paraphrase Guy, all he heard at home was about Morrow, and all he heard in the locker room was about Anne-Marie, and while Morrow was apprehensive, Guy encouraged the rookie to talk to his daughter. The rest, as they say, is history. What position did he play? Did he shoot left or right? What about his height and weight? Carbo played center and shot right. On hockey cards he is generally listed as being 5’11” and 185 pounds. What junior team did he play for? Guy played for the Chicoutimi Sagueneens of the Quebec Major Junior Hockey League from 1976 to 1980. What NHL teams did he play for? The Montreal Canadiens, St. Louis Blues, and Dallas Stars. When was he drafted by the Canadiens? Guy was drafted on August 9, 1979 by Montreal in the 3rd round, 44th overall. But he paid his dues in the AHL, right? What team did he play for there? Guy played for Montreal’s farm team at the time, the Nova Scotia Voyageurs, from 1980-82. When did he begin playing in the NHL? Guy made his debut on March 21, 1981 at the Montreal Forum against the Vancouver Canucks, but didn’t become a part of the Habs’ regular roster until the 1982-83 season. What was his career like as a junior? He had 182 points during his final year with Chicoutimi and has his number retired by the team. That should tell the tale. But he was a defensive forward in the NHL. Yes, he was asked by the Canadiens to become more defensive-minded and did so. What NHL awards did he win? Guy won the Frank J. Selke trophy (for best defensive forward) three times (1988, 1989 and 1992). What Stanley Cup teams did he play on? Guy won the Stanley Cup in 1986 and 1993 with the Canadiens, and 1999 with the Dallas Stars. In addition, he was on two teams that lost in the Stanley Cup Final: in 1989 with the Canadiens (who lost to the Calgary Flames) and 2000 with the Dallas Stars (who lost to the New Jersey Devils). Why did the Habs trade him? And what’s the story about the finger photo anyway? The official story at the time was that the Canadiens needed to unload Guy’s contract. 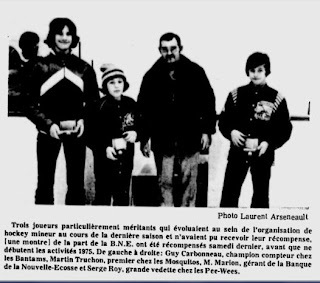 And yes, Guy was caught on camera giving the finger at a golf course in Montreal in 1994 shortly after the Canadiens were eliminated from the playoffs, which ultimately made the front page of Le Journal de Montreal. This was misinterpreted at the time as Guy giving the finger to Montreal fans (and many believe this was the reason for the trade), when in fact he simply wanted his privacy while playing golf and wanted the photographer to stop taking pictures. Guy was traded to the St. Louis Blues on August 19, 1994 for Jim Montgomery. When was Guy traded to the Dallas Stars? Guy was traded to the Dallas Stars on October 2, 1995 for Paul Broten. How many regular season NHL games did Guy play in? What about playoffs? Guy played in 1,318 regular season games, and 231 in the playoffs. In fact, he only missed the playoffs once in his career (1996 with the Dallas Stars). How many points did he have? Goals? Assists? Penalty minutes? 663 points –260 goals and 403 assists. He had 820 penalty minutes. At the end of the 1999-2000 season. His last game was on June 10, 2000, in which the Dallas Stars lost in the Cup Final to the New Jersey Devils in double OT. Was he ever named to any All-Star Teams? Guy was named to the QMJHL Second All-Star Team in 1980. He never appeared in an NHL All-Star Game during his playing career, but in 2009 he served as assistant coach to Claude Julien during the All-Star Game in Montreal. Did he ever represent Team Canada? During his playing career, no. He did coach the Canadian U-18 team in the World U-18 Championship in Belarus in 2010, and he also coached the Canadian men's hockey team at the Maccabi Games in Israel in July 2013, bringing home the gold medal! What other honours has Guy received? Guy is a member of the QMJHL Hall of Fame, and the QMJHL has also named an award after him (the Guy Carbonneau Trophy, which is presented annually to the league's best defensive forward). There is also an arena named after him in his hometown of Sept-Iles, Quebec. He is not yet a member of the Hockey Hall of Fame. What did he do after retiring from Dallas? He joined the Montreal Canadiens in the summer of 2000 as the director of youth development, but became an assistant coach under Michel Therrien in November 2000. He served in that capacity until 2002 when he moved back to Dallas to work as assistant GM. Didn’t the Stars place a one-year moratorium on his number being worn immediately after his retirement? Have any teams retired his number? Yes, that’s true. However, #21 has been worn in Dallas since his retirement. 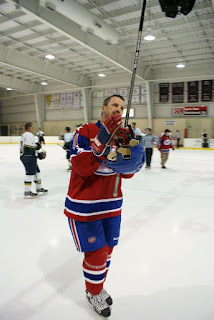 His number 21 is retired by the Chicoutimi Sagueneens, and it is this blog's opinion that it should be retired by the Montreal Canadiens as well (though that has not yet happened). When did he become head coach in Montreal? Claude Julien was fired by the Canadiens in January 2006. Bob Gainey, the GM, then took over as interim head coach with Guy as assistant. Guy took over as head coach in May 2006 and served in that capacity until being fired on March 9, 2009. Why was he fired by the Habs? No one seems to really know, not even Guy himself. But wasn’t he nominated for the Jack Adams Award for best NHL head coach? How could he get fired right after that? Yes, in 2008 he was nominated for the Jack Adams Award but lost to Bruce Boudreau, who was then coach of the Washington Capitals. And you tell me. I honestly have no idea. What was his record as Montreal head coach? What did he do after being fired by the Habs? 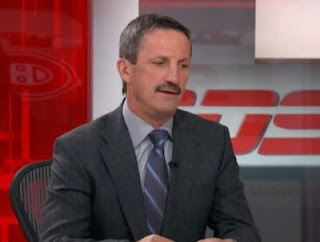 During the 2009-10 season he worked as an on-air analyst for CBC’s Hockey Night in Canada. In 2010 he also coached Canada’s U-18 team in Belarus, and starred on a TVA reality show about hockey, La Serie Montreal-Quebec. And for a few months in 2011 he was head coach of the Chicoutimi Sagueneens. Since the 2010-11 season, Guy has been working as an on-air analyst for RDS (Reseau des Sports; Quebec’s 24-hour sports channel). 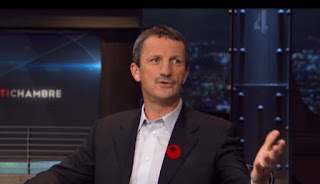 He appears during Montreal Canadiens games and on the sports discussion series, L’Antichambre. Most recently, he served as coach of Team Canada at the Maccabi Games in Israel (July 2013), winning the men's hockey gold medal. But didn’t he have to have his hips replaced? Yes, because of the wear and tear of his playing career. This occurred in 2008 and 2009. Did he really dent the Cup when he threw it off Vinnie Paul’s balcony? Somehow the Stanley Cup got dented after the Stars won it in 1999. Vinnie Paul, drummer of the band Pantera, claims that Guy dented it when he threw it off his balcony during a celebration party at Paul’s house, intending for it to land in the swimming pool. Carbo denies this story. The official keepers of the Stanley Cup also say it is not true. 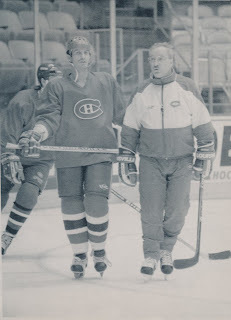 Are Carbo and Bob Gainey still friends after Gainey fired him from the Habs? How many times did Guy break his nose? According to a 2010 interview with TSN's Michael Landsberg, Guy broke his nose four times during his playing career. I've been meaning to do a blog post about this for a while -- the NHL arenas Guy played in have always been of particular interest to me, especially those that he played his first NHL game in...and his last. As part of this weekend's World Poker Tour festivities in Montreal, Guy participated in a shootout challenge with the Leafs' Phil Kessel. Guy was pitted against professional poker player Phil Laak. Also, yesterday at the event Guy spoke with Diana Cox about his poker experience. Have a listen here. Found this while surfing YouTube this evening. It always delights me when new Carbonneau material gets posted, especially stuff from the early years. This is a 1983 public service announcement for Grands Freres (Big Brothers), in Quebec. Happy Thanksgiving to those in the USA who celebrate! And as an entirely personal aside, after four years of owning them I finally found a way to display my game-worn Carbonneau skates! These prized items in my collection were just sitting on the floor while other useless junk was taking up precious wall space. Ridiculous. Anyway, I devised a way to hang them using cornice hooks from the hardware store and this is the end result. Very pleased! (These L-shaped hooks are also great for hanging game-used sticks, by the way.) Also, I received an income tax receipt for the alumni game I attended on November 10, since the ticket purchase was a charitable donation. What, I got to meet my hero and write it off on my income tax? Is this real life? 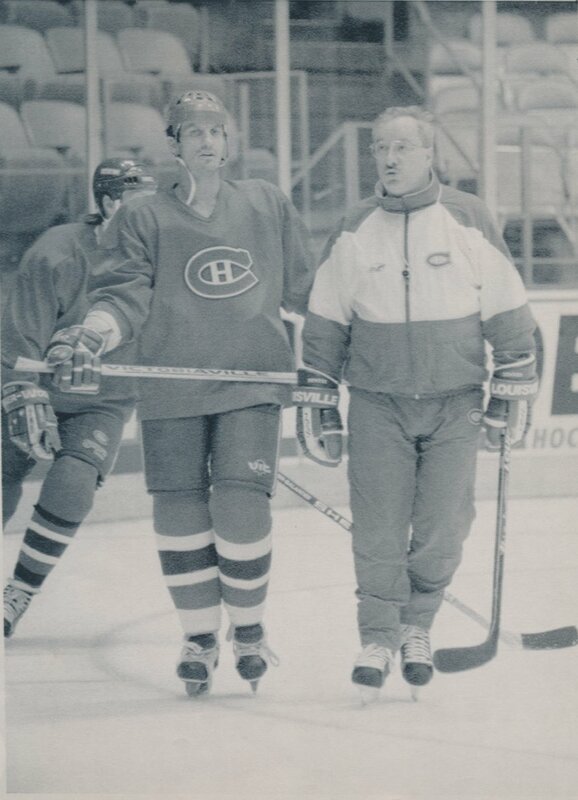 Here's Guy and coach Jacques Demers during practice on Great Western Forum ice in Inglewood, CA during the 1993 Stanley Cup Final between the Canadiens and the Los Angeles Kings. Love Guy's Gretzky-style JOFA helmet! A few video links I found: Here's Guy (in English) on why you shouldn't buy a counterfeit jersey (from last year's awareness campaign) and a brief Dallas Stars highlight video (the blood in that first shot!). As my friend Ron says, it's a pubestache with 36 years experience. Since I've recently posted about meeting Guy at the Match des Etoiles in Ottawa, I decided that I may as well do a write-up about the first time I met him. Yes, the encounter on Saturday was actually my second time meeting him. The first was in October of 2008 in Montreal. I learned in the spring/summer of 2008 that the parking garage at the Bell Centre is a great place to meet Habs players after practices. By then, I'd pretty much determined that I was going to try to meet Guy no matter what it took to do it, so I enlisted my friend Aisys (WordPress link), who'd been at the garage before, to help me. Also involved were the Montreal contingent, Kathy (who writes the Drummondville Voltigeurs blog Seven Thousand Volts and also writes at AllHabs.net) and Alex. We got to Montreal via Greyhound. The bus happened to stop right outside the Bell Centre, which was rather convenient, so we headed straight to the garage. Players spotted right away (the Habs were hosting the Bruins that night, it was the first home game of the season actually): Phil Kessel, Cam Neely, and Aaron Ward (who was wearing his ENORMOUS Stanley Cup ring he'd won with the Hurricanes). It took a while for the Canadiens players to start exiting the garage, and by the time they did, there was a good amount of people waiting. (Enough that security had to put up a barrier.) Some of the players gunned it out of the garage, which I honestly couldn't blame them for because I'd been told that autograph seekers in Montreal can be crazy -- there've been stories of them chasing the players' cars down the street. But many stopped to sign and take pictures. I'd been forewarned that the coaches are the last to leave, so I braced myself for a long wait. I was actually not paying attention when Carbo finally appeared. I heard Aisys say "Lisa..." and then a huge swarm of people around Guy's car (a beautiful convertible). First impression of Guy Carbonneau: incredibly gracious. I'm not kidding when I say there was a huge swarm, but he signed for everybody. I had my Dallas Stars replica jersey for him to sign, which I handed to him quietly because honestly, how do you find words when your hero is right in front of you? Look at me. I really do look terrified. Furthermore than that, I don't have any piercings! (I didn't begin to get really actively interested in body modification until 2009.) I should note that the young woman next to Guy in the car is his daughter Kristina, and I couldn't help but think that it must be strange to have all this attention centered around your father. The Carbonneau daughters grew up with it and I'm sure they're used to it, but still. I guess it can be seen as somewhat crazy that I travelled all the way to Montreal for an autograph and a picture, but it was something I wanted to do, and in the end I'm glad I did it. We spent the rest of the day touring the city, ate lunch at St-Hubert (yum), visited the Bell Centre store (yikes are souvenirs ever expensive in Montreal), relaxed in a park (I won't tell you what I wrote on a park bench, though perhaps you can guess), almost got interviewed by CBC News (Aisys told the reporter in regards to me "she's a big Guy Carbonneau fan"), and then jumped on the subway to catch the bus back to Ottawa (it was interesting to watch the throngs of people in Habs jerseys come up from underground, on their way to that night's game). 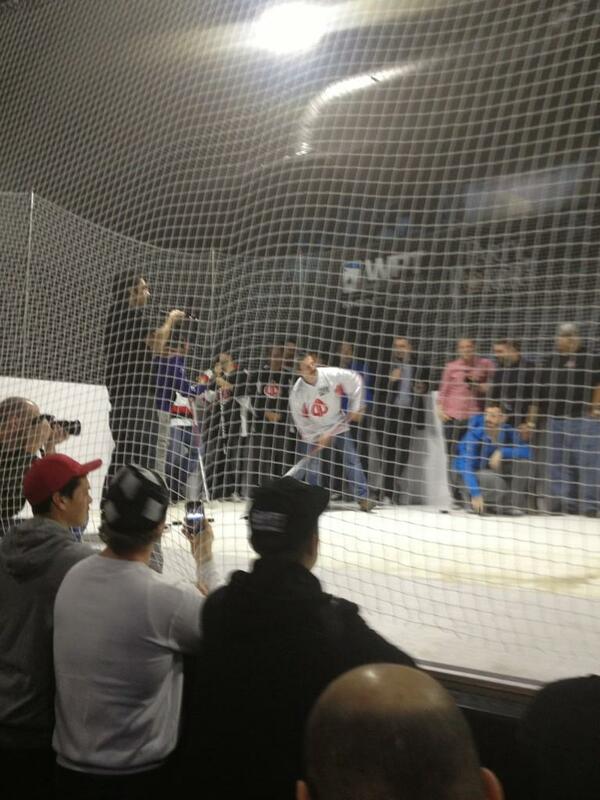 The other thing I learned: hockey is very serious business in Montreal. Which was underscored later on in the season and the following March, when the Canadiens relieved Guy of his duties as coach. Will there be a third time? Who knows. For now, I'm grateful for the first two. Third post, then this is it for today, I promise. You may notice that the blog has a new layout. Yes, after doing this blog for over a year, I decided to give it something other than the basic Blogger layout. The header photo is by photographer Bob Fisher and originally appeared in the December 1986 issue of Les Canadiens. (Note the then-new Stanley Cup ring on Guy's hand.) Image edited by me. I hope the readership will forgive me for doing this, but I'm going to do an off-topic blog post. Well, maybe it's sort of on-topic because it is about hockey. There are very few current players that have managed to capture my imagination and my loyalty the way Guy has. That is not to say that I don't love the current NHL (lockout aside), but I guess I just like the old guys. One of the exceptions to this rule has been goaltender Pascal Leclaire. Regulars to this blog will know that I am an Ottawa Senators fan, and Leclaire came to our team in 2009 when he was traded from the Columbus Blue Jackets for Antoine Vermette. At the time I was furious -- Vermette was one of my favorites (and a player who I believe has a lot of parallels with Carbo). But in time I warmed to the goalie. I was struck by his personality and humility. Those who have played with him have said that he's a great teammate. 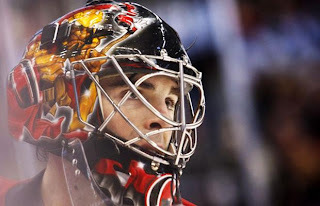 Unfortunately, Leclaire battled injuries throughout his career and the expectations when he came to Ottawa were high. The injury bug hit him again with the Senators and he never did live up to those expectations. But I was still a fan anyway. Being a goalie fan is tough -- goaltenders have so much responsibility and often are the first to get blamed after a loss. I'll admit that I got into a few Twitter fights defending Leclaire. Best of luck in your retirement, Pascal. I'll miss you on the ice. Found this neat, short promo for Guy on RDS the other day. Also, of course this blog is doing updates on Movember -- here's a good read from the blog Hab It Her Way on why the cause is so important. This afternoon I was fortunate enough to attend a Habs alumni game in Ottawa, at the University of Ottawa sports complex. This event was sponsored by the Franco-Ontarienne foundation and Desjardins. And yes, Guy was on the roster. I feel so lucky to have now seen him play "in person," even if it was years after he retired from the NHL. He may be older and he may perhaps be a little slower, but everything that Diane Lau wrote in her marvelous 1999 essay Carbonneau at Ice Level still holds true today. The man is absolute magic on the ice. It is quite easy to imagine him taking flight. After the game, there was an after-party at the Draft sports pub, which is also located in the sports complex. 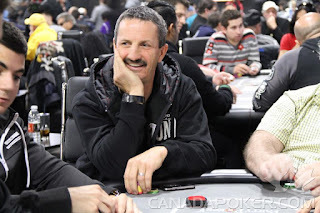 This is Guy Carbonneau, after all, and I found myself needing a beer to shore up my confidence to talk to him. (Fortunately refreshments were provided with the price of the ticket.) I finally made my way to the table where the Habs alumni were signing autographs, got my program signed by the team, and made my move. I asked Guy for a picture. I was temporarily thwarted by a malfunctioning camera flash. Oh no! "The flash is not on!" said Carbo, attempting to instruct the person I'd enlisted to take the picture. This man, kind soul, absolute class act that he is, patiently waited through FIVE failed pictures. In a panic, I hit every button on my camera that I could possibly think of and finally got the damn thing working. Then, Guy graciously stood for another picture. Yes, that is your blogger, complete with blue hair and piercings. As for Guy, this post could also serve as a State of the 'Stache update as the Mo is coming along quite nicely. I didn't mention the blog -- I thought that would possibly be overkill -- but I did shake Guy's hand and tell him that I was one of his biggest fans, which I'm sure he's heard a million times before but in my case I believe it is really true. I wonder if he noticed my necklace. As a final note on this encounter, while I was waiting in line someone gave Carbo an absolutely beautiful photo of him to sign, a black and white of him when he was quite young. It's rare when I find a Carbonneau photo I haven't seen before. I wish I'd thought to ask the person where they got it. I'd like to thank the Franco-Ontarienne foundation and Desjardins for putting on such a great event. It was a blast! Thanks especially to Philippe who was so kind and helpful when I ordered the tickets. Finally, from heroes on the ice to heroes who I believe are far more important -- today is Remembrance Day. I capped off my day by attending Poppy Day at my local tattoo studio. Please take a moment today to remember those who have served and who currently serve, who protect us and fight for our freedom. Way to go, Michael Peca! Also of note is this Hockey News blog post from four years ago that I recently found, which also makes the case for Carbo. As of 2013, Guy will have been HHOF eligible for ten years, and pardon my expression but it's bloody ridiculous -- induct him already. It's still in the embryonic stages as you can see.